I’ve been giving Valentines Day quite a bit of thought this week, on account of the fact that my previous lapses never worked out that well, so I’m going all in with the flowers, the dinner out, and one of those really expensive Hallmark cards to show my wife that when it comes to her happiness, money is no object. Oh, and these little cherry pies to top things off, too. I agree – none of that is very original. But in the absence of originality, predictability – on Valentines Day – is a very safe bet. That’s something I learned during one of the aforementioned lapses. Actually, the cherry pies are sort of original. I’ve been testing some new mini pie recipes for my next pie book and latched onto the idea of filling little graham cracker pie shells with stovetop cherry filling, and topping them with mascarpone whipped cream, which is really sensational if you’ve never made it. 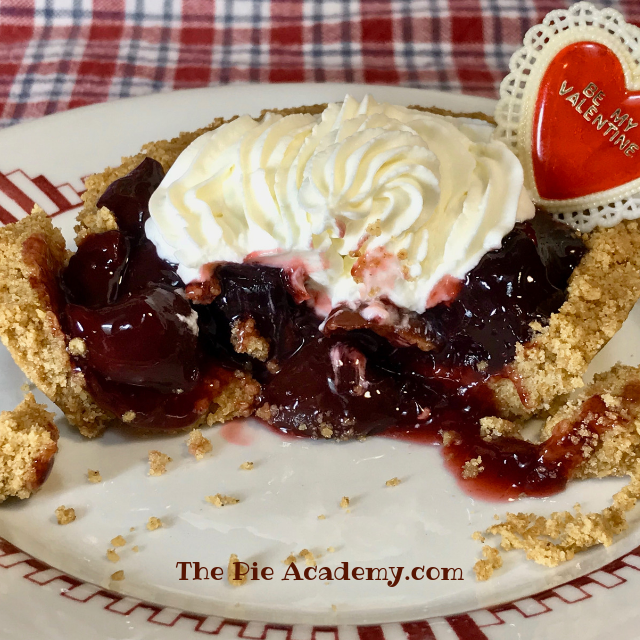 There are a number of appealing things about the recipe: you can make it with frozen cherries, which work great in pies. You can make the shells and filling a day before serving, so there’s no last-minute stressing. As for the mascarpone whipped cream, it’s good and stable so you can pipe it on and it holds its shape beautifully, as you can see in the photos. It’s just plain delicious, too. Let’s talk about the graham cracker shells. The first two shells you see here were made in mini foil pie pans that measure about 4 1/2 inches in diameter. I just prebaked the shells for 8 minutes at 350°, let them cool, and then popped them out of the pans. That’s one option. The shell you see in the third photo here was made in a jumbo muffin cup. I formed the walls to come to the top of the cup, but you really don’t need to make them so tall. Two-thirds of the way up the cup would be plenty big enough. A couple of tips: make all the walls of your graham cracker shells fairly thick; they’ll be less likely to break when you remove them from the pan. In order to make pack-able shells, you may need to add a teaspoon or two of milk to the crumb mixture, so it’s a tad more moist. You will also want to lay a narrow, 8-inch long strip of wax paper in the buttered muffin cup before you form the shell. Press it against the bottom and sides. That will give you something to help loosen the shells and lift them out after the cups cool. Of course, you can always serve the pies directly in a mini pie pan, which is no doubt the easiest and most sensible option. And you don’t have to be too concerned about how packable the crumbs are since you’re not removing the shells from the pan. I hope you’ll give these a try, for Valentines Day or any day. During cherry season I make these with fresh fruit, but it’s handy to have the frozen cherry option this time of year. Here’s hoping your Valentines Day is full of love and fond memories. Last week’s new video for our Mushroom and Blue Cheese Apps racked up quite a few first-week views. So if you haven’t watched it, you might want to give it look. The video was aimed at Super Bowl party throwers, but these are sensational anytime appetizers. While you’re over there at our YouTube channel, I hope you’ll subscribe to it. Thanks. 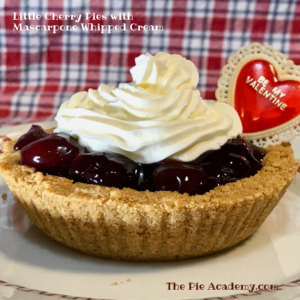 Whether you're making these for your Valentine... looking for a delicious pie to make with frozen cherries...or you have a quart of fresh cherries just begging for your attention, these little pies are just the thing. And you'll adore the creamy mascarpone whipped cream topping. Prepare the Graham Cracker Crust mentioned above. Be sure to make the crumbs good and fine. (The crumbs are hard to pack if they're too coarse.) Once the mixture is prepared, press some together between your fingers. It should pack easily. If not, add a teaspoon or two of milk and rub it in thoroughly to moisten the mixture so it holds together. 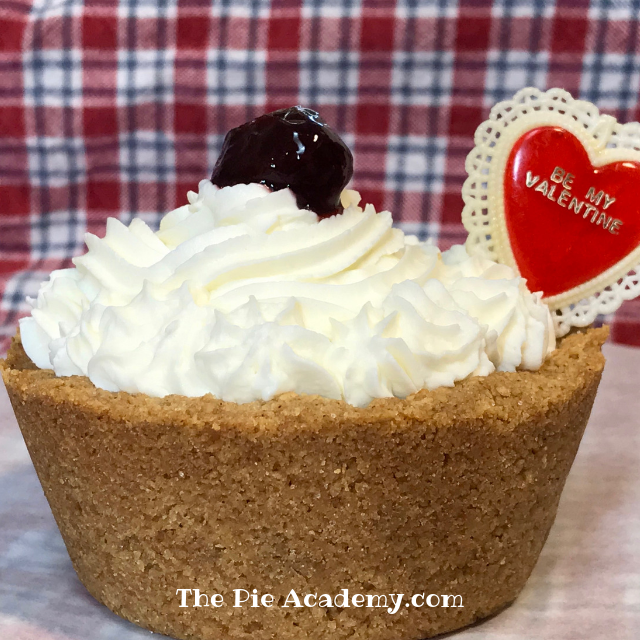 Divide the mixture evenly between 4 or 5 mini pie pans or jumbo muffin cups - read accompanying post - pressing it firmly against the bottom and sides of the cups. Make the shell walls about 1/4-inch thick. Refrigerate for 10 minutes while you preheat the oven to 350°. When the oven has preheated, place the shells on the middle oven rack and bake for 8 minutes. Transfer to a cooling rack and cool thoroughly. Make the filling: Put the cherries in a medium saucepan, cover, and slowly heat them until they come to a simmer. Add the sugar, orange juice, and lemon juice. Cover and simmer 2 or 3 minutes, until quite juicy. As the fruit simmers, blend the water (or juice) and cornstarch in a small bowl, then stir into the fruit. Bring the fruit to a low boil, then cook at a low boil, stirring nonstop, for 1 1/2 minutes, until thick and glossy. Remove from the heat and stir in the vanilla. Scrape the fruit into a pie plate or dish and cool thoroughly. Make the mascarpone topping: get out the bowl you're going to make the whipped cream in and chill it for 10 minutes. Add the mascarpone cheese to the bowl. Using a hand held electric mixer, beat the cheese for a minute on medium-low speed to loosen it up. It will probably stay clumpy as you beat. Gradually add the heavy cream while you beat; the mixture will thin out. Once all the heavy cream is added, increase the speed and continue to beat until the mixture forms soft peaks. Stop the machine and add the confectioners' sugar and vanilla. Continue to beat just until the mixture forms stiff peaks. Do not overbeat or it will begin to curdle. Refrigerate until needed. To assemble the pies, spoon some of the cherry filling into each pie shell. Mound the whipped cream on top of the filling, or pipe it on with a pastry bag, then serve. To make a graham cracker crust, add 3 cups coarsely-crumbled graham crackers to a food processor. Add 2 tablespoons sugar, 1/4 teaspoon cinnamon, and 1/8 teaspoon salt. Process to fine crumbs. Transfer to a bowl and add 5 tablespoons melted unsalted butter. Mix it in with a fork, then rub it until the mixture is even and packable. If it doesn't pack when you press it between your fingers, add 1 to 2 teaspoons milk and rub that in until the mixture packs. NOTE - If you're starting with packaged crumbs, simply add 2 cups of the crumbs to a bowl and proceed as above.